We all like to save time so now I'm going to show you a few quick tricks to save a few seconds whilst using the Samsung Wave, many of the tricks are also possible on other Samsung mobiles. None of these are particularly amazing though they will help you save a small amount of time which can add up if you use the phone a lot. We start by looking at the quick method of opening the task manager. If you want to open the task manager the "normal" way you need to go through a number of menu screens which can take quite a while and is incredibly fiddly. If you just go to the home screen and hold the "menu key" for a few seconds you jump straight to the task managed saving yourself the time and effort of going through the settings screens. In fact this takes about 3 seconds and is very direct. So as you can see this short cut is much better. This is a trick most users should already be well aware of but if not it's worth sharing. This little menu you can see is just a drag down menu from the top of the screen and by dragging it down you can turn on, or off, the Wi-Fi, the Bluetooth and Silent mode. This is great for when you just need to turn off something like Wi-Fi to save the battery or turn the volumne off to go into a meeting. 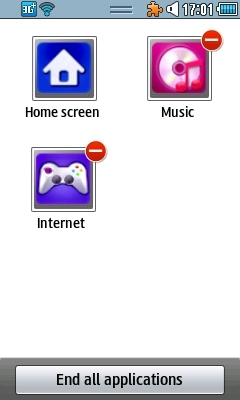 Each of these 3 settings can be turned on or off through the various menu's though the fact you can do them all here is much quicker and easier than fiddling with a host of multiple screens. This final time saving trick takes a little while to set up so I've broken it into the steps you need to use for it to work. It's a trick that some folks will find of more use than others, though if you use the phone for one thing a lot it will be a good trick to learn. 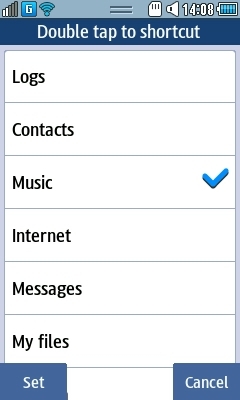 Firstly you need to open the "Menu" then click settings and "General" which puts you on this screen here. 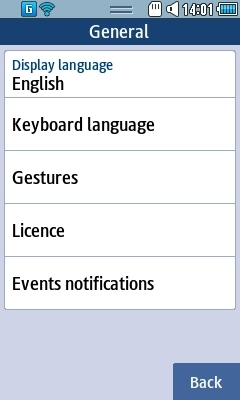 The you need to select "Gestures" from this screen. 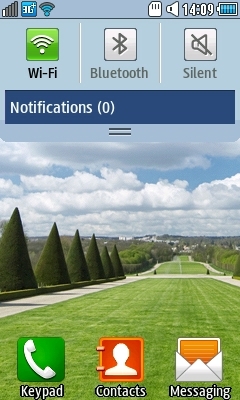 In "Gestures" you will see a screen like this. The option you want to set it "Double tapping" and make sure that a little light is showing next to it as this is what we are wanting to use. After you click on the dot to put the light on you need to click where it says "Double tapping" to open a long list of options. The options screen should look something like this (though it has a lot more options than were caught on this screen shot) you need to select the option you want to use. In the case of this example it's going to be "Music" as I like to use my phone to listen to music so it's a good short cut for myself. Others may want to use it to skip to the camera, or the games or soemthing else. By double tapping the screen on the homepage I'm now zoomed straight to my music and ready to listen to all my tracks with out needing to go through the menu screens. This is a great little trick though one that you need to really use the phone a fair bit to make the most of. Although this trick does take a little whilst to set up it's pay off in the long run is great and really is a trick you should be using if you want to use the phone for all it's worth. Of course the phone will have more time saving tricks though these are some of the best ones and easiest ones so are worth using and knowing that they are all there to use.